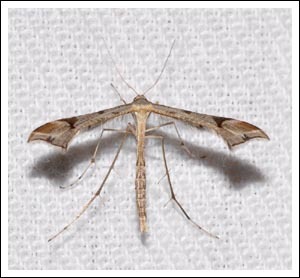 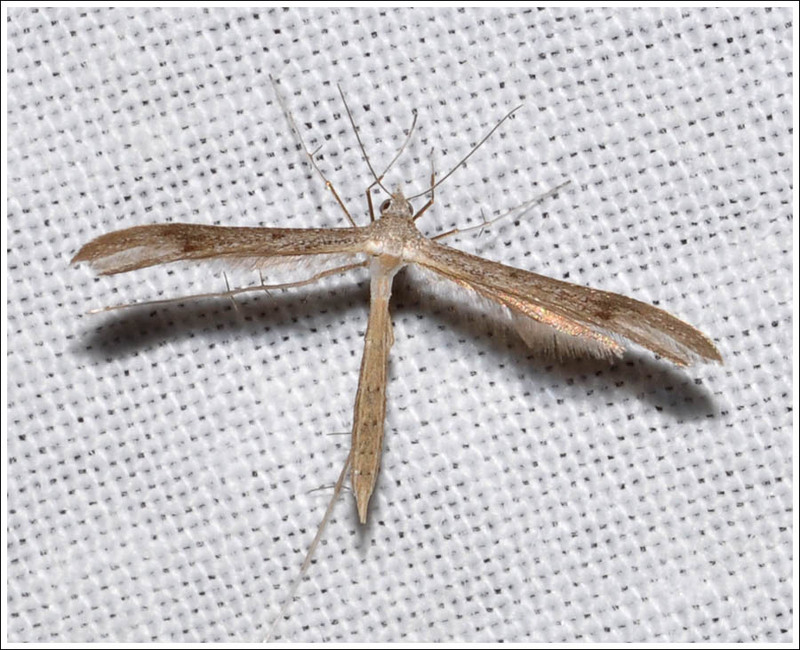 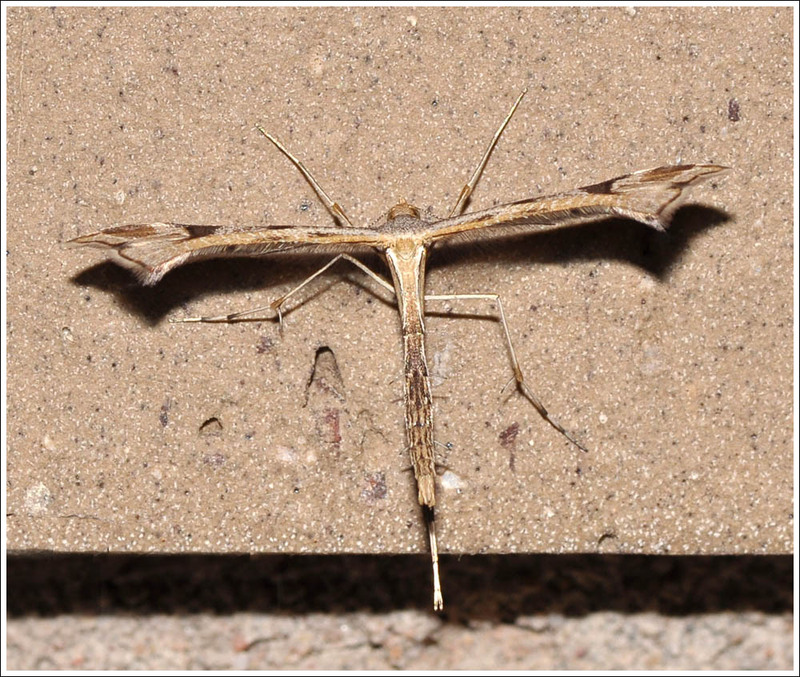 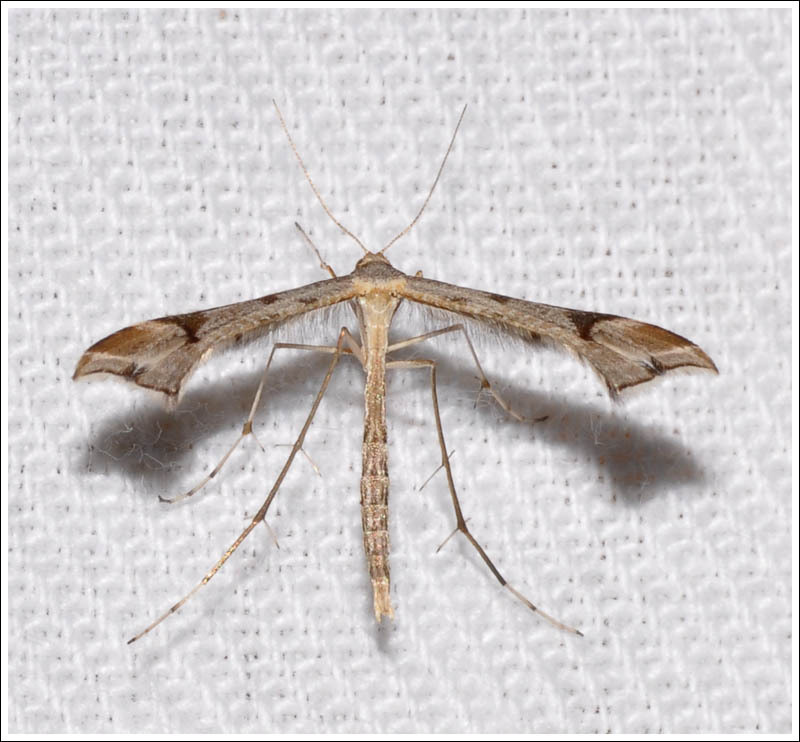 ….fragile, and insubstantial, sometimes not much larger than a big mosquito, they can be easily overlooked on the moth sheet, and difficult for the camera to keep in focus, particularly if the sheet is moving in the breeze. 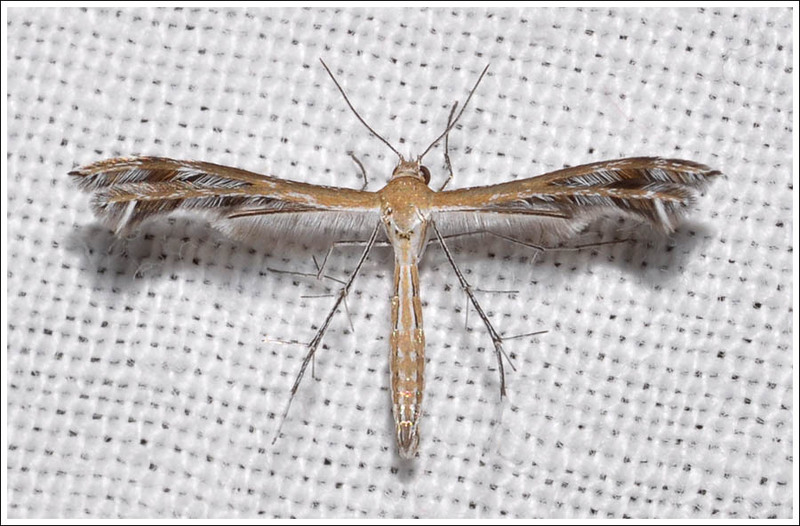 The most common species in this part of Gippsland is Platyptilia emissalis, the larvae of which feed on the Speedwells, a group of plants variously known as Veronica, Parahebe, and Derwentia, but now apparently settled in Veronica. 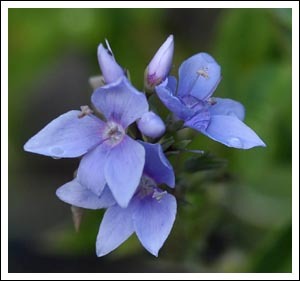 The garden has plants of Digger’s Speedwell, V. perfoliata, and Derwent Speedwell, V. derwentiana, the former Bill Cane’s white form, the latter his blue form, and the moth is consequently common. 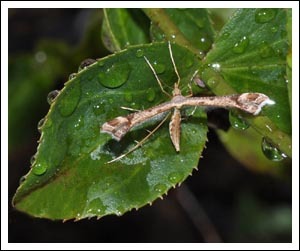 On more than one occasion a gravid female has been seen on the Derwent Speedwell. 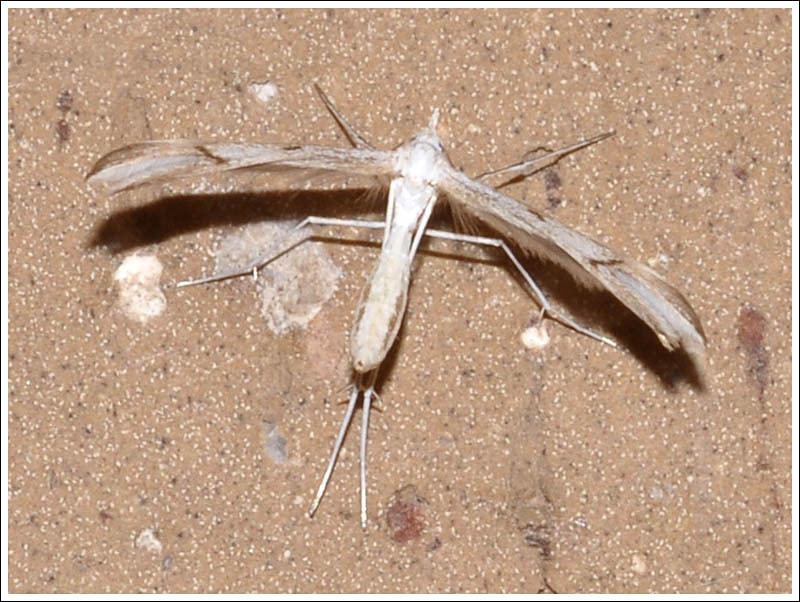 Two more photos, the second showing the moth resting with rear legs together, as seen sometimes. All photos are greatly enlarged. 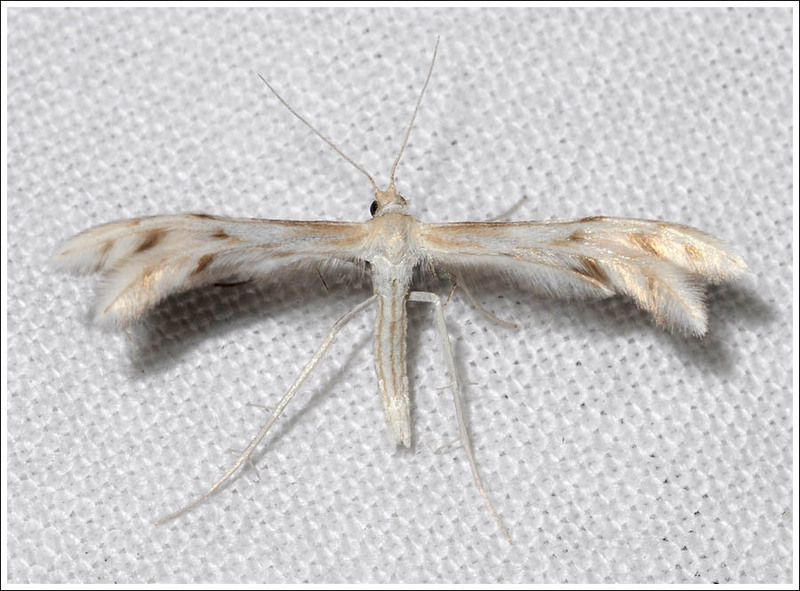 The next moth, Wheeleria spilodactylus was deliberately introduced in an effort to control Black and White Horehound. 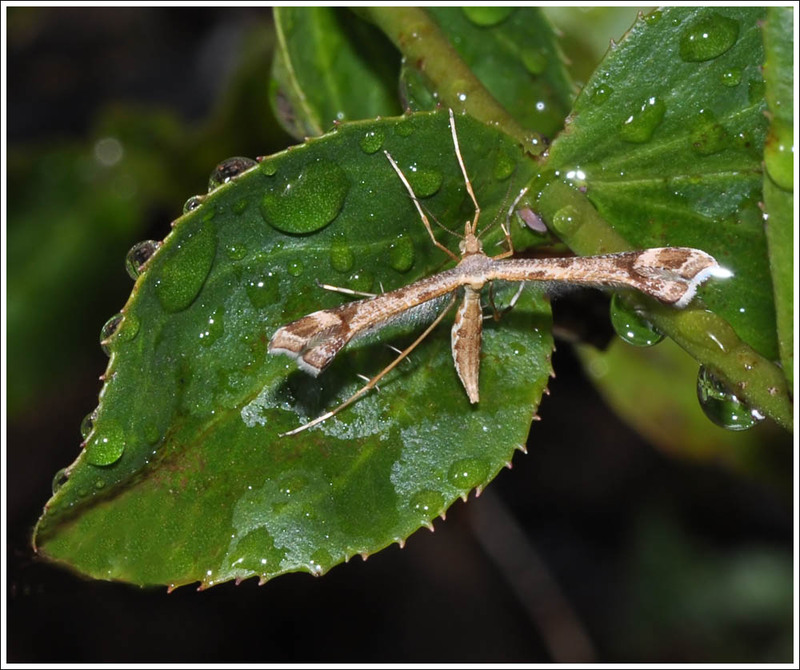 On hatching, the larvae bore into the young shoots and work their way down to the mature foliage. 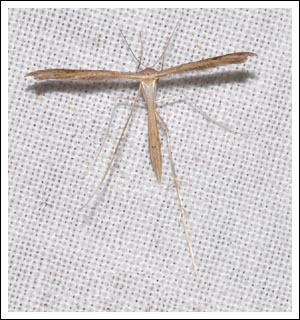 Platyptilia celidotus is a species characterised by two dark marks on the forewings. 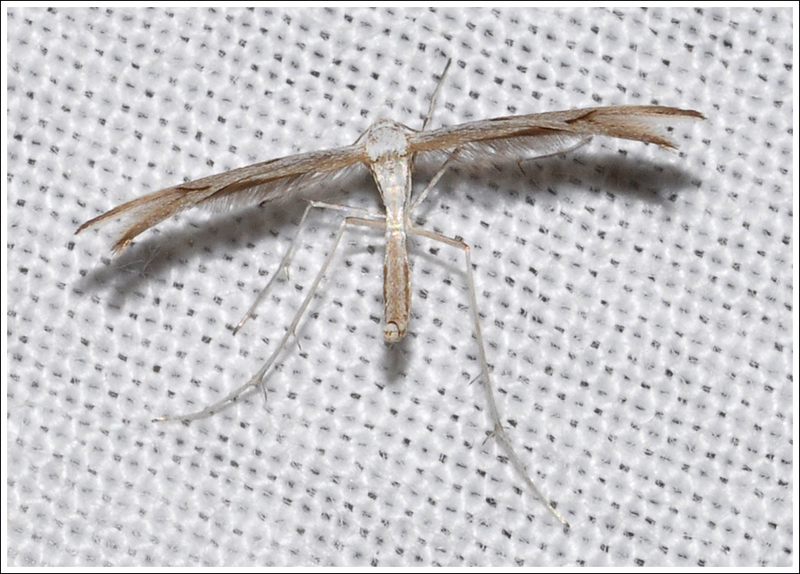 Stenoptilia zophodactylus is tiny with a wingspan of about one centimetre. 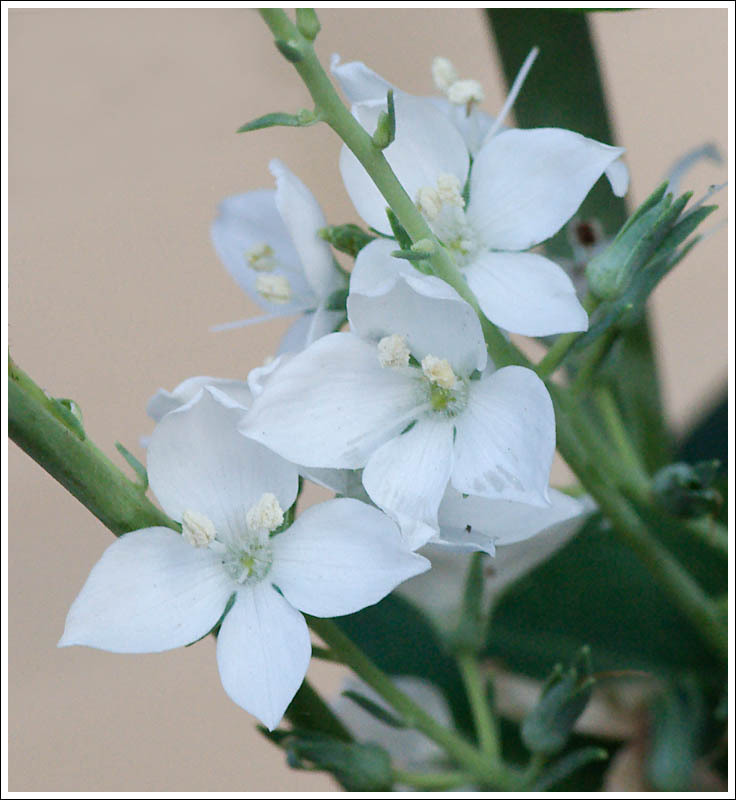 It is found all over the world and the larvae feed on plants in the Gentianaceae family. 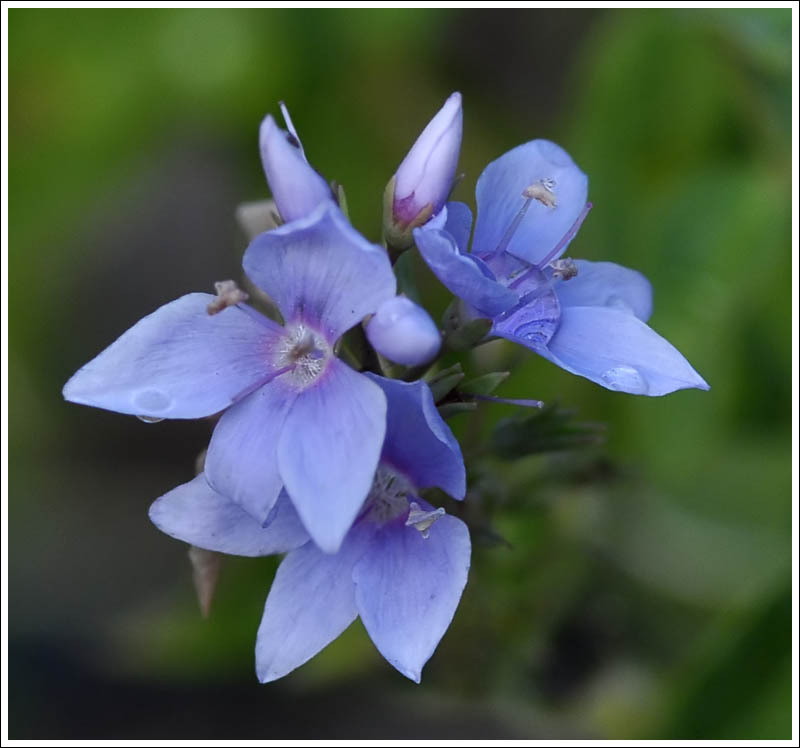 The Common Centaury, Centaurium erythraea is widely found in the bush where these were photographed. A characteristic of this moth is the extreme length of its hind legs. 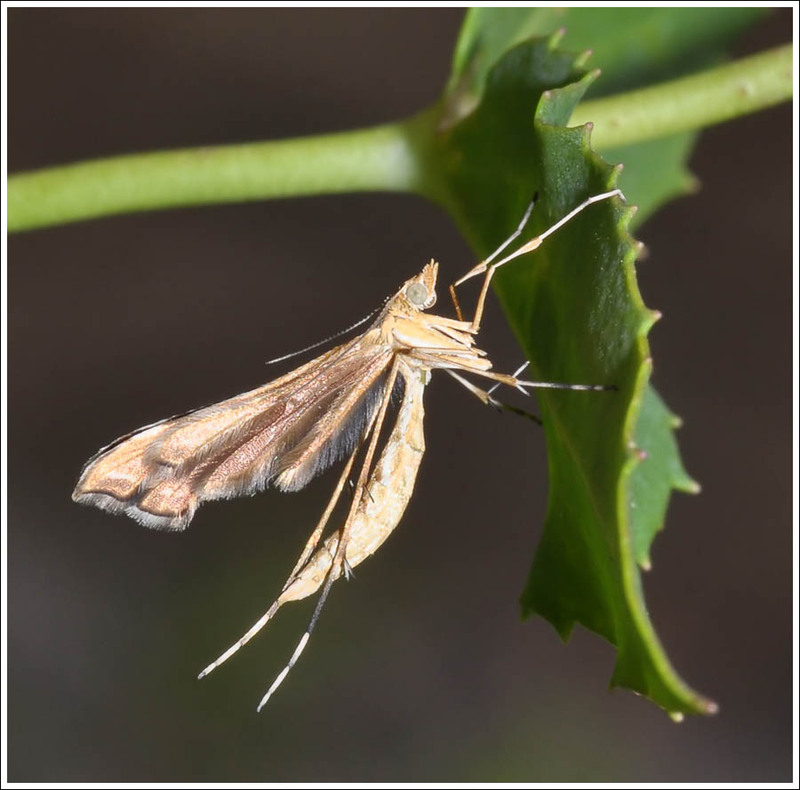 Finally, Stangeia xerodes, nicely showing the wing plumes that give the group their common name. The larvae feed on a variety of plants including the tender foliage of wattles. 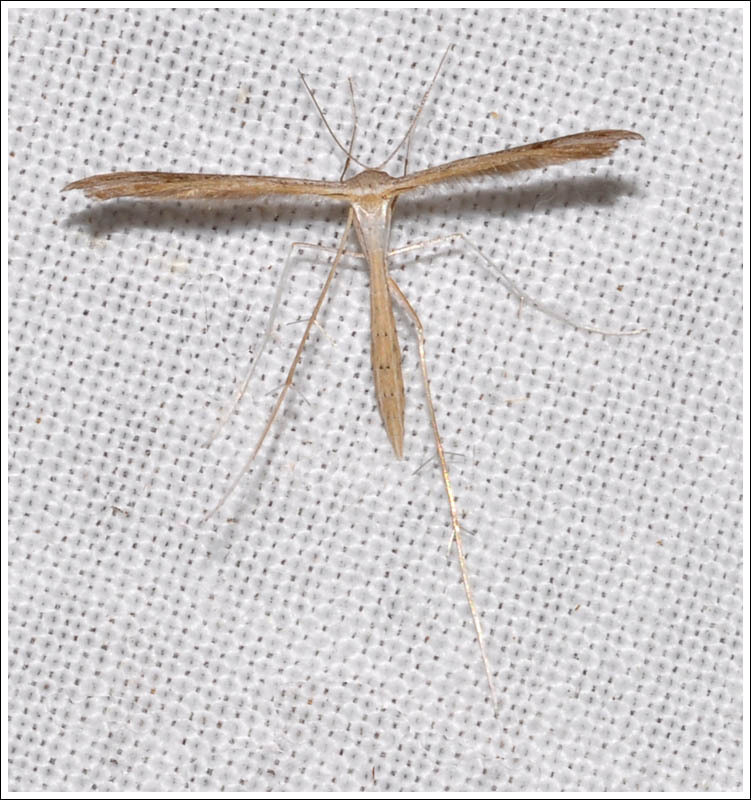 Posted on September 19, 2016 July 18, 2018 by PholodesPosted in Pterophoridae, Moths.